The following Vindale review is designed to offer general information about this rewards website, how it works, what rewards it has to offer, and all other essential features. In addition to that, we will also point out ways you can contact the company in case you need help or have any questions. Furthermore, this Vindale review will point out some of the most common complaints coming from its users. These include their having issues taking surveys or receiving too many emails from the company and its affiliates. We will discuss more about this later on in the article. Vindale is a rewards website of the GPT or ‘Get Paid To’ type that offers cash rewards in exchange for completing various tasks. Though it mostly offers standard online surveys or video surveys, you can also earn rewards in other ways as well. Is Vindale Legit or a Scam? It seems clear that this website is legit even just from taking a look at user reviews. While people do have some issues with it, none of these indicate or even hint at this site’s being a fraud. Vindale presents a neat interface that clearly lists how you can earn rewards. It also explains how it makes payments and that there is no sign-up fee. If you ever pay for anything, it’s for products or services you choose to opt-in. Surveys: You will find daily surveys on the Vindale website that you can take to earn cash. Reward Codes: If you join the Vindale community on their blog or social media pages, you will find things like polls and challenges that have reward codes. In turn, these are worth some money. Member Photos: Vindale rewards you for taking a snapshot or a video of your earnings. Reward Mail: If you opt-in to receive emails, you can earn cash for reading paid promotional messages. Watch Videos: You can watch video surveys and provide feedback that earns you cash, but only if you are eligible for it. Referral Program: If you refer friends to join Vindale, you can receive a reward each time someone signs up with them by following your referrals. Although many other similar websites offer a variety of rewards, Vindale appears to only have one recompensation for its members: cash. No matter the ways you decide to use this website, you are rewarded with various cash amounts. Some options are worth more than others, and you cannot take any money out until you have accumulated $50. When you do choose to cash out your earnings, you can do so by using PayPal. You can also have Vindale send you a check through the mail. Cash Payout: Vindale is one of the rare few rewards websites that offers just a cash payout. This is a definite benefit for those looking to make money and who aren’t interested in earning things like gift cards. Other Ways to Earn: You can do more than just take surveys on this website. Rather, Vindale offers some other ways you can earn cash as well. More Than One Payment Option: Another good point about Vindale is that it has more than one option to withdraw your money. Payout Limit: Compared to other similar websites, Vindale has a high cash out limit ($50). The issue that makes matters worse is that it can take a long time to make enough money to reach this minimum payout. Eligibility Requirements: One main concern with Vindale (that is somewhat common across survey websites) is that you must meet specific criteria to take surveys. This can, and does, limit a lot of members as it’s easy to get disqualified from a survey. Many users claim that they are unable to take many of the surveys offered. In some cases, too many people have already taken the survey, so it expires before others can get to it. Or, in other cases, users are unable to get into surveys because of the eligibility requirements. Some reported an issue with the rather high number of emails they receive from either Vindale or their partner companies. Unfortunately, you can’t really fix these issues by yourself. For the surveys, you can try taking more that appeal to your interests so that you can qualify for other similar surveys. As for the email situation, you can eventually unsubscribe from whatever service you signed up for once you’ve earned the rewards from Vindale. Official Website: To speak with someone from Vindale, you can call 1-855-846-3253. You can also contact its team by sending an email to support@vindale.com. Social Media/Other: Vindale is active on social media websites such as Facebook and Twitter where you can also send them messages. 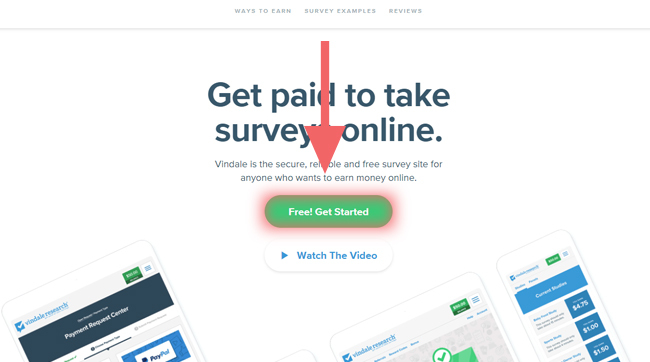 To summarize this Vindale review, this website seems to really deliver what it claims: cash payments for taking surveys, referring friends, etc. There are some concerns about its minimum payout limit and issues with taking surveys, but all in all, the pros seem to outnumber the cons. This being said, Vindale does appear to be a decent website to earn some extra cash, but it’s certainly not the website to use if you want to earn a lot of money in a short period of time. If there are readers that have already used or are still members of this website, feel free to comment and let us and others about your experiences or make suggestions. Not particularly happy with Vindale or would just like to try out other such websites? Check out the following and take your pick!